Since the violent contact between Indigenous peoples and European colonists in the late eighteenth century, Indigenous cultural production has been marginalised by the dominant culture. During the twentieth century, the discourse surrounding Indigenous art from Australia gradually shifted from anthropology to aesthetics.1 Even as that shift began to occur, there loomed the constant threat that any production not regarded as sufficiently ‘authentic’ by Europeans would be consigned to the category of kitsch. While the art market still hungers after the signs of ‘authentic’ work supposedly untainted by the stain of intercultural interaction, recent exhibitions focus on the transformation in the position of Indigenous art within the artworld (or what still counts for one). At the beginning of the twenty-first century, Indigenous art stands as one of the most prominent and vital forms of contemporary art, because it focuses attention upon the conflict over temporality and the definition of contemporaneity itself.2 One of the key challenges remains the problem of outlining conditions of possibility for contemporary art that can account for the intersection of Indigenous and non-Indigenous perspectives. 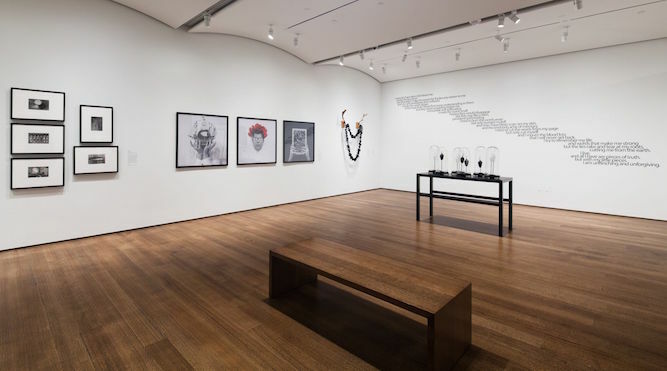 Installation photographs of Everywhen: The Eternal Present in Indigenous Art from Australia, Harvard Art Museums, Cambridge, Massachusetts, 5 February-18 September, 2016. Photograph courtesy of Harvard Art Museums. At the centre of this debate stands Everywhen: The Eternal Present in Indigenous Art from Australia, an exhibition at the Harvard Art Museums. Curated by Stephen Gilchrist, the Australian Studies Visiting Curator at Harvard University, Everywhen elegantly and succinctly intervenes in crucial debates animating not only studies of Indigenous art, but contemporary art more broadly. Both thematically and physically, Gilchrist organised the exhibition and its space around four key topics: seasonality, transformation, performance and remembrance. Seasonality refers to the ecological knowledge that Indigenous peoples from Australia have accrued over thousands of years of inhabiting the continent. Transformation refers to the narratives Indigenous people offer to explain the origins of the world, and how mythical and other beings have become part of the physical, psychological and mythic landscape. Performance indicates the role of ceremonies and rituals practiced by Indigenous peoples as a means not only of renewing their bonds to the landscape, but also of forging and reinforcing social bonds. Finally, remembrance focuses upon the formation of cultural memory, especially in relation to colonial histories of dispossession and displacement in Australia. These four themes, the exhibition asserts, encapsulate important aspects of the experience of Indigenous peoples, and become means for negotiating their experience of time. It enfolds bodily, environmental, narrative and mnemonic modes of experiencing time. Time as the simultaneous experience of multiple forms of worldly inhabitation constitutes a central argument of the exhibition. As its title suggests, the exhibition argues that Indigenous art distinguishes itself by focusing on a layered relationship to past, present and future experience. On these grounds, Indigenous art is contemporary for it occupies, physically and discursively, multiple temporal registers. When viewed in the gallery, the work is said to refer back to mythic pasts, to lived experience and to offer means of imagining alternative futures. Those sets of temporal relationships, moreover, are constantly renewed through the production of art. Finally, the exhibition offers what may be deemed analogous to a Kantian a priori, insofar as that multi-temporal experience of art is said to form a condition of experience for Indigenous peoples. Put another way, the exhibition argues that temporality operates as a flux, rather than a linear flow, within Indigenous conceptions of the world. Such temporality is then both epistemology and ontology, knowledge and constitution of the world. Based on this reading, Indigenous art from Australia theorises the contemporary as comprised of multiple and simultaneous times. It is akin to Boris Groys’s argument that in the contemporary time overflows attempts to offer singular and coherent historical narratives.3 Nonetheless, while Groys seems to imply that the spectator can occupy a position from which to observe that excess of time, the exhibition of Indigenous art theorises time as excess, time as pathways between different historical events and imagined futures. Owing to its focus on the multiple threads of time within a given moment, the exhibition echoes a form of the contemporary offered by Terry Smith. Smith writes that the contemporary ‘signifies multiple ways of being with, in, and out of time, separately and at once, with others and without them’.4 For all the emphasis on difference, however, Smith seems to occupy a position from which to survey the field of art production. It remains possible, however, that the Archimedean point occupied by Smith gives way to a form of time that can only be experienced through its internal conjunctions and disjunctions. Moreover, both Groys and Smith implicitly view the contemporary as a set containing multiple, conflicting elements, but leave the set itself uncontested. It may be that the contemporary is as marked by conflict over its own form and definition as much as antinomy between its elements (temporal, discursive or otherwise). In keeping with its proposition regarding complex articulations of time and history, Everywhen offers a means of re-evaluating the contemporary as a paradoxical interface between cultures. This approach involves a critique of Peter Osborne’s concept of contemporary art.5 One of Osborne’s main claims is that contemporary art is postconceptual art. Contemporary art, for him, acquires its definition as contemporary because of its historical position not only after but also in response to (predominantly North American and European) conceptual art of the 1960s and 1970s. As Ian McLean succinctly notes, ‘Osborne’s underlying point is that the “contemporary” has acquired the historical significance that the “modern” held for most of the twentieth century, thus usurping its former paradigmatic function.’6 Whereas the modern, for Osborne (as for others, such as Groys), attempts to envision and create a future, the contemporary involves a ‘co-presentness of a multiplicity of times’.7 Just as the exhibition Everywhen advances a complex, layered experience of time, so too does Osborne advance the thesis that the contemporary is defined by a ‘disjunctive’ logic, meaning that the present comprises multiple, fractured and intersecting modes of inhabitation. 4 An expansion to infinity of the possible material forms of art. 5 A radically distributive – that is, irreducibly relational – unity of the individual artwork across the totality of its multiple material instantiations, at any particular time. Emily Kam Kngwarray, Anwerlarr angerr (Big yam), 1996. Synthetic polymer paint on canvas. National Gallery of Victoria, Melbourne, Purchased by the National Gallery Women's Association to mark the directorship of Dr. Timothy Potts, 1998, 1998.337.a–d. © Emily Kam Kngwarray/© 2015 Artists Rights Society (ARS), New York/VISCOPY, Australia. These premises ground contemporary art, and its period, within the legacy of conceptual art, leading to his summary position that contemporary art is postconceptual art. The disjuncture of Osborne’s thesis refers to the manifold relations, practices and narratives in art after internalising the ‘failure’ of conceptual art to locate the specificity of art solely within its aesthetic character. Osborne’s attempt to found a concept of the contemporary on a rigorous philosophical basis offers a rich and complex theory of art and temporality. Two points are most relevant to the current discussion. First, Osborne’s thesis focuses almost exclusively on the history of Western art and artists, noting that it is chiefly conceptual art and its lessons from Europe and North America that provide the foundational conditions for contemporary art. Second, the contemporary, by his own thesis, fundamentally involves disjunction. Insofar as that disjuncture manifests itself, his theory invites critique, amply provided by Gilchrist’s curatorship. 1 Conceptual character in Indigenous art. Indigenous art, whether related to stories of the Dreaming, a time of creation that continues to influence the present and requires an individual to renew his or her relationship to the law and the land,9 as in the work of Doreen Reid Nakamarra or Emily Kame Kngwarreye,10 or histories of settler colonialism in Australia, as in the work of Christian Thompson.11 Vernon Ah Kee’s many lies (2004), a text work installed on one of the walls in the space engaging with remembrance, serves as a powerful irruption within the often deadpan use of text within the conceptualist paradigm. Cascading down the wall, his acerbic poem cuts like a scar across the white wall. It declares the violence of colonial history in Australia, the violence associated with the imposition of culture and the irrevocable losses and personal confusion that result from dispossession. 2 The aesthetic dimension of Indigenous art. 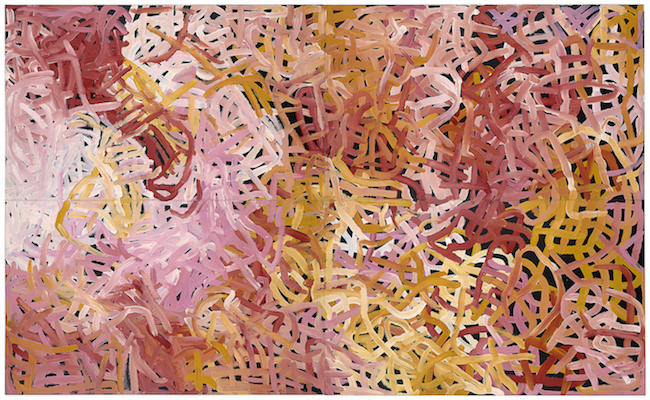 As the exhibition demonstrates, Indigenous Australian art adopts a material instantiation. Most prominently, Kngwarreye’s Anwerlarr angerr (Big yam) (1996) commands the space of the viewer, its four-panels asserting the persistence of both women’s body painting practices among the eastern Anmatyerr (her language group in what is now the Northern Territory), as well as enduring claims to land shared with her ancestors. 3 Non-aesthetic dimension of Indigenous art. Work by Nakamarra reveals that painting need not remain lodged within a Kantian aesthetic ideal of detached purposeless, but can serve emotional, intellectual and concrete ends through a renewal of spiritual and cultural claims to land. 4 Range of materials. From painting (Nakamarra) and photography (Thompson) to glass (Yhonnie Scarce) and text (Vernon Ah Kee), the exhibition indicates the varied materials used by Indigenous artists. 5 Distribution of work. 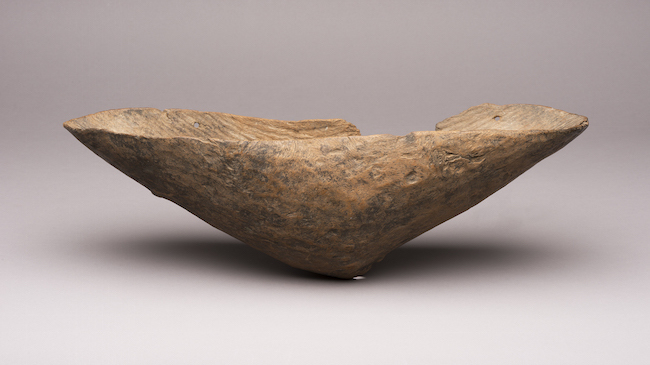 In addition to their installation in the Harvard Art Museum, the anonymous coolamon (a wooden vessel for carrying food and water) was previously installed in the Peabody Museum of Archaeology and Ethnology at Harvard University. It thus demonstrates the capacity for an object to move through alternative registers of meaning and value, hence entering alternative discursive fields. 6 Disjunctive unity of meaning. In the case of the coolamon, situating the work in multiple contexts, without a seeming limit to that possibility, indicates the capacity for a work to enter into ‘new relations’.12 The work is thus not identical to any singular instance, but accrues meaning as it moves through institutional and discursive, Indigenous and non-Indigenous contexts. A historical account of the object would thus entail accounting for a shift from an anthropological to an aesthetic context. 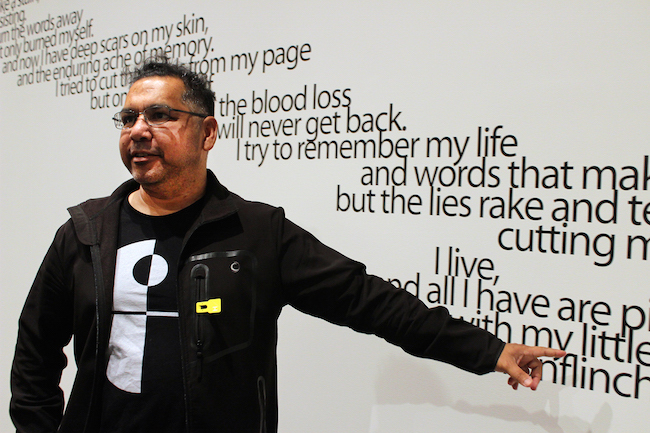 Artist Vernon Ah Kee and his work, many lies (2004). 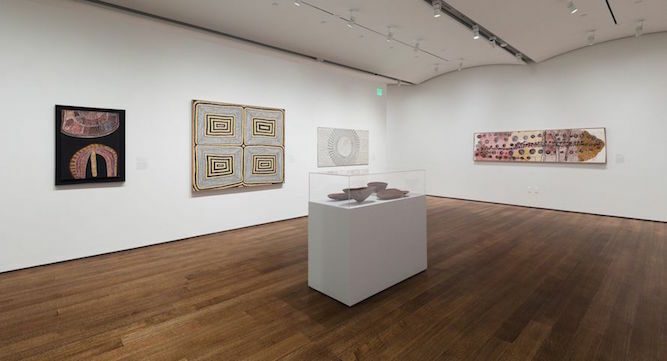 View of the exhibition Everywhen: The Eternal Present in Indigenous Art from Australia on display February 5–September 18, 2016 at the Harvard Art Museums. Photo: R. Leopoldina Torres, © President and Fellows of Harvard College. Rather than cut the Gordian Knot of the contemporary, theorisation of the contemporary as offered by Everywhen figures as a double-edged sword. It asserts that Indigenous art occupies a central position not only in the institutional definitions of contemporary art, but also in the theorisation of contemporaneity. In doing so, the exhibition displaces the Eurocentric orientation of Osborne. Yet, the foregoing discussion also lodges Indigenous art in relation to a Eurocentric paradigm, albeit one threatened by its presence. In this respect the exhibition offers a response to Eric Michaels’s claim, originally made in the context of debates over commercial, cultural and aesthetic values, that Indigenous art is ‘the product of too many discourses’.13 Indigenous art in Everywhen appears less as a discursive surplus (assuming that such excess could be strictly determined) than as a position from which to interrogate other discourses, while also asserting its own internal concerns. When examining Osborne’s claims in relation to Indigenous art, it appears that contemporary art thus does not depend upon its postconceptual status. While it could be argued that Osborne’s six claims permit the visibility of Indigenous art as contemporary art, the works and concerns of Indigenous artists predate, such as the coolamon, those conceptual practices that Osborne identifies as essential precursors for the experience of the contemporary. In a similar gesture towards the postconceptual, Rover Thomas’s Yari country (1989) successfully binds together aesthetic and non-aesthetic aspects of artistic production. At one level, the painting narrates the story of Wati kutjarra (Two Men).14 The old man’s story begins in the lower right, in the red ochre section denoting the drought-ravaged desert. White dotes bordering this area signify the water billabongs, where the old man drunk attempted to quench his thirst. After discovering that the water was poisonous, he attempted to light a fire, shown by the black quadrant in the upper left. Trapped in the resulting conflagration, he was consumed by the flames, but his spirit entered and became the land. At a material level, Thomas brings the landscape into the painting by incorporating ochres found in the Kimberley, an area in western Australia where he settled. By including works such as these, the exhibition reveals that the contemporary does not require a definition founded solely in conceptual art. Instead, alternative reference points for understanding contemporary art and its history can be discerned. As a result, Osborne’s six key theses seem to lack a basis specific to conceptual art, as they can be shown to be present in Indigenous art, even that predating conceptual art by several decades. Osborne’s own project, then, circles back on itself. Operating as an immanent critique, the disjuncture at the heart of both Osborne’s project and Everywhen paradoxically converge. Indigenous art, then, has always already been contemporary. Unidentified artist, Kimberley region, Coolamon. Wood. Collected by the University of Pennsylvania Museum of Archaeology and Anthropology, 1896–1931. Peabody Museum of Archaeology and Ethnology, Harvard University, Cambridge, Massachusetts, Museum purchase, Museum Improvements Fund, 1932, 32-68-70/D3968. © President and Fellows of Harvard College, Peabody Museum of Archaeology and Ethnology, PM32-68-70/D3968. That paradox can be expressed in terms akin to Osborne’s original formulation that ‘contemporary art is postconceptual art’. If Indigenous art does not require a postconceptual paradigm (in Osborne’s historical sense) for its contemporaneity, then the contemporaneity of Indigenous art may not correspond to the contemporary of postconceptual, non-Indigenous art. From these premises obtains a revised claim: ‘Indigenous art is contemporary art’. Everywhen posits disjuncture within theory itself. In its model, the contemporary appears as a condition unable to adequately contain itself, unable to be bounded, a condition in which conflict and debate over the term becomes a central feature. The exhibition highlights not only different temporal experiences in the contemporary, but alternative forms of contemporaneity itself. Perhaps, then, Osborne’s thesis could be recast one (provisionally) final time: ‘Indigenous art is meta-contemporary.’ It is contemporary art about the possible forms the contemporary may take. The undecidability of theoretically prescribing the contemporary hence becomes its central problematic. The exhibition could thus be said to figure forth the contemporary not only as internally disjunctive, but also (and paradoxically) as aporetic at its very core. Everywhen succeeds in demonstrating the fundamental position Indigenous art must occupy in any discussion of the contemporary, precisely because this art places intense pressure upon some of the most theoretically rigorous conceptions of contemporary art. The exhibition and the artists it includes theorise a vision of the contemporary as fractured, not just in the experience of time, but in the very constitution of the contemporary itself. The exhibition, and the theoretical issues it raises in relation to Osborne’s theory of the contemporary, indicates that any theory of the contemporary must be marked by contest over its own possibilities. To settle into a static concept of the contemporary would no longer be contemporary. Of course, to advance such a thesis imposes another order of fixity, and so would require a self-reflexive theorisation that emphasises its own contingency. Before the contemporary itself can be theorised, then, its conditions of possibility must be established. 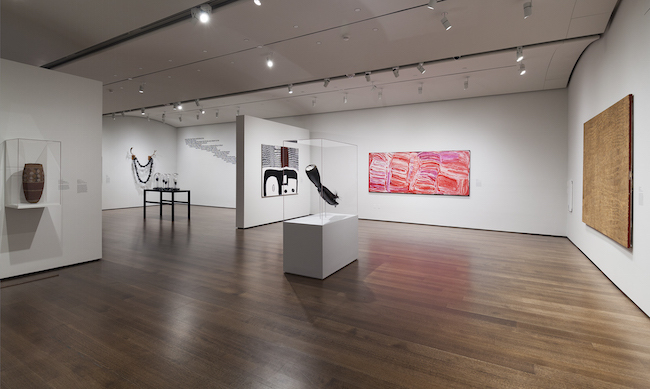 View of the Performance-themed gallery in the exhibition Everywhen: The Eternal Present in Indigenous Art from Australia on display February 5–September 18, 2016 at the Harvard Art Museums. Photo: Harvard Art Museums, © President and Fellows of Harvard College. The exhibition foregrounds the problem of defining the contemporary, while showing the importance of visibility for Indigenous art given the historical invisibility and oppression of Indigenous peoples. To move within the contemporary is not just a case of locating alternatives to modernism or negotiating its aftermath. Everywhen reveals the cultural stakes in any assertion of criteria for defining the contemporary. To address the contemporary is to reckon with Indigenous forms of knowledge and their claims to both the past and the present. From the vantage of Everywhen, the contemporary appears as a condition marked by the contingency of its own conditions of possibility. Such a state need not be met with resignation, but may be viewed as an opportunity to engage in intercultural exchange while offering the hope, but not the guarantee, that persistent structural inequalities between Indigenous and non-Indigenous peoples may yet be overcome, in and across times. 1 On the incorporation of Indigenous Australian art into the museum and gallery sector, and the problematic concomitant reception in terms of modernist ideals of innovation and genius, see Cath Bowdler, ‘Shimmering Fields,’ Artlink, 28, no 2, 2008, pp 30-33. Of course, aesthetics may also be a problematic discursive frame, insofar as it applies Eurocentric concepts to Indigenous art. This challenge will be taken up below. For a critique of the view that anthropology necessarily imposed European conceptions of art on Indigenous work, see Howard Morphy, ‘Seeing Aboriginal Art in the Gallery,’ Humanities Research, 8, no 1, 2001, pp 37-50. 4 Terry Smith, What Is Contemporary Art?, University of Chicago Press, Chicago and London, 2009. See also Terry Smith, ‘Currents of World-Making in Contemporary Art,’ World Art, 1, no 2, 2011, pp 171-188. 9 Erin Manning, Relationscapes: Movement, Art, Philosophy, MIT Press, Cambridge, MA, 2009, pp 158-159. The title of the exhibition reflects attempts to understand the Dreaming. The Australian anthropologist W E H Stanner coined the term ‘everywhen’ in 1953 to refer to a narrative of past experience, a charter of possible future events and a system for ordering the universe and granting it meaning. See W E H Stanner, The Dreaming & Other Essays, Black Inc. Agenda, Melbourne, 200, pp 57-72. The Dreaming is of course an invention of Western anthropologists. In Indigenous languages, words for creation include Wangarr in Arnhem Land, Tjukurrpa and Altyerr in Central Australia, and Ngarranggarni in the East Kimberley. 11 Christopher Morton, ‘The Ancestral Image in the Present Tense,’ Photographies, 8, no 3, 2015, pp 263-265. 16 Chris Healy, Forgetting Aborigines, University of New South Wales Press, Sydney, 2008, p 7. 17 There remains the risk that dominant forms of culture in Australia may recuperate Indigeneity, rather than permit individuals to define Indigeneity without recourse to non-Indigenous discourse. As Laura Fisher argues, non-Indigenous interest in Indigenous art can serve to promote political, cultural and social causes, but can risk lapsing into a self-serving, redemptive gesture. 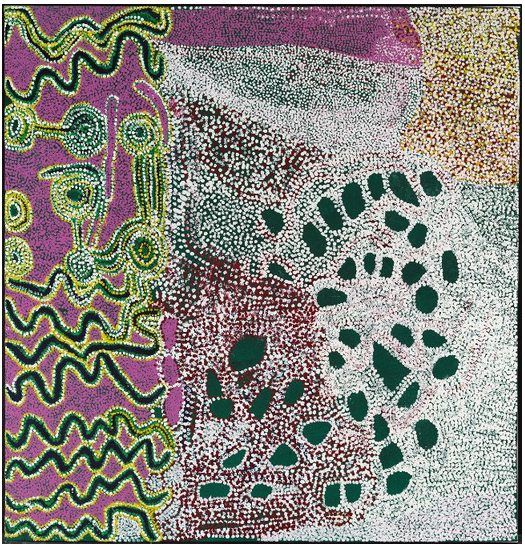 See Laura Fisher, ‘The Art/Ethnography Binary: Post-Colonial Tensions within the Field of Australian Aboriginal Art’, Cultural Sociology, 6, no 2, 2012, pp 251-270. Sustaining the disjunctive logic of the contemporary requires the possibility of refusal. On the need to preserve the agency of individuals, see Ian McLean, Ian McLean, ‘Provincialism Upturned,’ Third Text, 23, no 5, 2009, pp 625-632. The need to preserve agency is made particularly evident by Jennifer Biddle, who argues that Indigenous art functions as a means of resistance to the ongoing political oppression of Indigenous peoples in Australia. See Jennifer Loureide Biddle, Remote Avant-Garde: Aboriginal Art under Occupation, Duke University Press, Durham, 2016. On productive cultural collaborations involving Indigenous and non-Indigenous artists and advisors, see Quentin Sprague, ‘Collaborators: Third Party Transactions in Indigenous Contemporary Art,’ in Double Desire: Transculturation and Indigenous Contemporary Art, ed, Ian McLean, Cambridge Scholars Publishing, Newcastle upon Tyne, 2014, pp 71-90. Christopher Williams-Wynn is a doctoral student in the Department of History of Art and Architecture at Harvard University. He is co-founder and co-editor of Dissect Journal and co-editor of emaj (electronic Melbourne art journal).